Under the leadership of Satya Nadella, Microsoft has regained the ground it lost to other tech giants in previous years and is set to capture even more attention and market share in the years to come. One of the keys to Microsoft's success has been the steadily rising adoption of its Office 365 subscription service - including the widely used Office 365. 1 in 5 corporate employees now use an Office 365 cloud service. Office 365 is the most widely used cloud service by user count. In addition to the special Office 365 licenses extended to education and government organizations, there are many industries finding Office 365 to be the best productivity and cloud solution available. At the moment, the financial services industry has the highest rate of usage. This makes sense, since traditionally, financial firms have been quick to adopt new technology and are also heavy users of Office apps like Excel. Microsoft's focus on making its cloud services meet FISC and GDPR data protection requirements also make Office 365 a natural choice for an industry that regularly deals in the transaction of sensitive data. 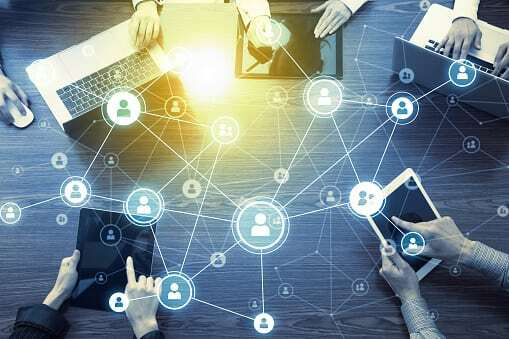 Second only to financial services, the manufacturing industry has migrated to using Office 365 and especially the OneDrive app for cloud storage at a rate of over 26% of its users. Initially slower to adopt, the healthcare industry has seen an uptick of recent usage, partly due to Microsoft creating an in-house team specifically tasked with serving their needs. Microsoft held a Healthcare & Life Sciences Virtual Conference last January and have ensured that Teams has the HIPAA compliance and features healthcare groups need to make that platform their default communication tool. In the legal field, The American Bar Association recently published an article touting the benefits of Office 365 for legal firms - which highlighted specific legal use cases for Office 365 groups, Teams, and automations using Microsoft Flow. Has Microsoft Already Won the Cloud War? According to Bitglass, usage of Office 365 globally in 2016 was around 34%. That number grew to 56% by Q3 of last year. This means Office 365 users now make up over half of the 81% of total organizations who have made the shift to cloud services. 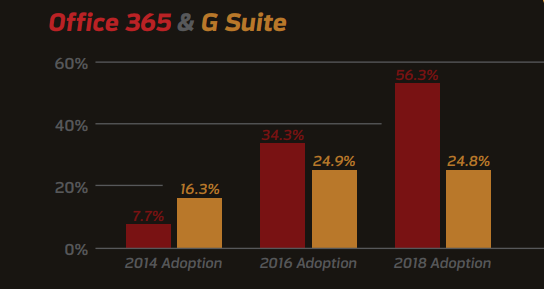 Compare that with the relatively stagnant growth of Google's G Suite since since 2016. There are now over 155 million Office 365 business users (2018). Outlook mobile app users reached 90 million in 2017. Microsoft office has been downloaded on Android over 1 billion times (2018). Office 365 made its Mac App Store debut in January of this year (2019). There are now 500,000 businesses using Microsoft Teams, including 91% of the Fortune 100 (2019). What does this mean for SMB's? On one hand, the future looks bright. With Windows 10 and Office 365 subscriptions that have been shown to bring a positive ROI within 13 months of investment, there are plenty of licenses and options to suit any business. The workforce will continue to trend towards a "work from anywhere on any device" model and small to mid-sized businesses who don't invest in a proven cloud service solution now run the risk of not being able to compete in the areas of staffing, productivity, and production in the future. Do you need to speak with a cloud services expert about Office 365? We're happy to answer any questions you might have.